New design ringboard has 2 rings instead of metal clip. Architects and engineers have requested more document security on job sites. Steel hardware. White coated hardboard has 2 ring metal riveted with USA hardened steel tubular rivets. Spacing on rings is 2-3/4 inch center to center. Common two hole paper punch. Board is 12 x 9 inch O.A., use letter size 8.5 x 11 inch paper forms documents, checklists. Hole punch on the short side. 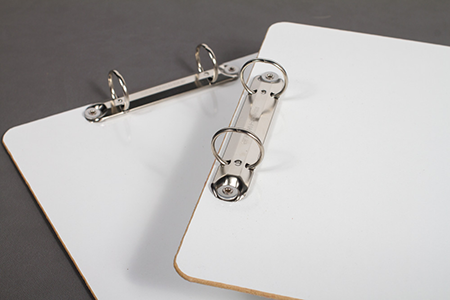 2 Ring clipboard becomes a top opening forms holder. No clip. Hard board has been coated with Melamine under heat and pressure. Two sides yielding smooth writing surface. Two ring 2R ring board doubles as a handy dry erase board. Rare 2 ring metal with ring spacing 2-3/4 inch center to center was once a common item. An 8.5 x 11 form with 2 holes punched on the short side 8.5 was ubiquitous. Forms industry has shrunk with computer digitalization. Paper forms, envelope manufacturers have diminished. Paper is concrete. No matter how documentation is stored, sooner or later Some one wants to see it on paper! Your paperwork is important. Use Crane Binderï¿½s 2 ring ring boards.